Among the thousands of volumes in the personal library of the distinguished American poet Robert Creeley (1926-2005) are Creeley's copies of Presences: A Text for Marisol (New York: Scribner's, 1976). The book is a collaboration between Creeley and the Venezuelan sculptor Marisol Escobar, with 30 pages of prose poetry published adjacent to 61 black-and-white photographs of Marisol's works. As was his habit, Creeley used the paper-bound copy of Presences as a kind of filing cabinet for ephemera relating to its publication: some of the letters, postcards, photographs, and reviews found inside the volume are shown on the shelf below. This exhibit was occasioned by the 2018 publication of a critical edition of Presences, edited by Stephen Fredman, Professor Emeritus of English at the University of Notre Dame and was curated by George Rugg, Curator, Special Collections. The Hesburgh Libraries acquired Creeley's personal library of more than 6,000 volumes in 2012. Established by the Nazis in Terezín in northwestern Czechoslovakia in 1941, Theresienstadt served as both a ghetto and a transit camp for Jews before being deported to one of the extermination camps. The Nazis, however, went to great lengths to present this detention center as a "model Jewish settlement" and to hide the role it played in their plan to systematically exterminate the Jewish people. In an elaborate ruse, they created fake ration cards, contracts for home purchases, deposits for rent, special currency, and even beautified the camp, renovating barracks and planting gardens, before the International Red Cross visited the camp in 1944. Between November 24, 1941 and May 9, 1945, over 141,000 Jews including about 15,000 children were transported to Theresienstadt. Of these Jews, about 33,500 died in Theresienstadt and more than 90,000 were deported to death camps in eastern Europe. This exhibit, highlighting some of RBSC's Holocaust-related materials, was curated by Julie Tanaka, Curator, Special Collections. January 27, 2019—International Holocaust Remembrance Day—commemorates the memory of the victims of the Holocaust. On display through the end of 2018 was a French map of the United States and adjoining areas created shortly after the end of the Revolutionary War, showing the new nation's boundaries and those of its constituent states. This exhibit was curated by George Rugg, Curator, Special Collections. Images of Mary Shelley's monster being created by the mad scientist delight and horrify audiences. Yet, these images also illuminate larger issues about humans and science. Showcased in this display were Humphry Davy's Elements of Chemical Philosophy, J. E. Ford's Popular Science essay "Can Science Raise the Dead?" and David Plunkert's new, illustrated edition of Frankenstein. This exhibit was curated by Julie Tanaka, Curator, Special Collections. Mary Shelley's imagination created a monster who has captured artistic imaginations for two centuries. Theodor von Holst introduced the monster visualy in 1831, in the first illustrated edition. His creation remained the main representation until the 20th century when Jack Pierce and his makeup wizardry made Boris Karloff the iconic monster. Variations of this icon abound on covers of comic books and magazines. This exhibit celebrated his birthday with a visual tour in Special Collections' fall spotlight exhibit Frankenstein 200. Artist Didier Mutel adapts Hans Holbein's "Dance of Death" skeletons to apply to individuals from Forbes Magazine's annual list of the world's wealthiest people. Showcased in this display were plates from Mutel's oversized portfolio, juxtaposed with Holbein's woodcuts from 1538. This exhibit was curated by Marsha Stevenson, Visual Arts Librarian. This spotlight exhibit displayed a small selection from the Irish-American periodical collection at Notre Dame's Special Collections. These periodicals circulated in the late nineteenth century, and provide an intriguing view of the ways in which a distinct Irish-American culture developed, and of the identification of the Irish with the Catholic Church. From illustrated weekly magazines to almanacs, the Hesburgh Library's collection covers an array of these publications. The description of McGee's Illustrated Weekly as 'chaste, choice and chatty' is an indication of the style of literature aimed at by some of the editors. The exhibit was curated by Aedín Clements, Irish Studies Librarian. During the 17th and 18th centuries, missionaries from the Society of Jesus introduced European science to China and used it for a novel purpose, spreading Catholicism among the Chinese ruling class. Displayed in this month were four fascinating works from this endeavor, highlighting the tremendous efforts by Jesuits and the historical background in which they operated. This exhibit was curated by Yang Wu, Librarian in Residence. Shown this month were three whaling manuscripts dating from the golden age of the American whaling industry in the first half of the nineteenth century. These included two ship's logbooks, from the whaling vessels Meridian and Corvo, and a letter written aboard the whaler Columbus. In 2015 RBSC acquired a collection of more than 450 examples of baseball-related sheet music, dating from before the Civil War to the late 20th century. On display in this spotlight exhibit was a small sampling of the collection, with items ranging from the early days of baseball to the end of the Tin Pan Alley era. The examples on display in this spotlight exhibit were selected from Special Collections' Baseball Sheet Music Collection. 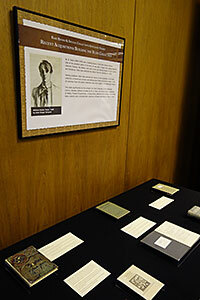 The exhibit was curated by George Rugg, Curator, Special Collections. On display was a manuscript fragment written in Beneventan minuscule, the script associated with the great Benedictine abbey of Monte Cassino. The fragment contains music for the feast of the Epiphany and survived because it was reused as the cover of a later printed book. This exhibit was curated by David T. Gura, Curator, Ancient and Medieval Manuscripts. Abraham Lincoln issued the Emancipation Proclamation on January 1, 1863. 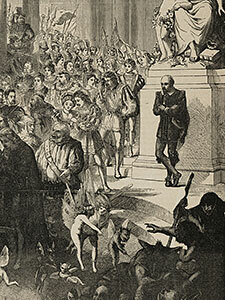 This 1864 steel engraving by James W. Watts was adapted from a drawing, Reading the Proclamation of Emancipation in the Slaves' Cabin, by New York City artist Henry Walker Herrick. Very few pictorial depictions of the proclamation were made before Lincoln's assassination in 1865 and this is the only contemporary image that offers an interpretation of how it might have been received by the people it was intended to free. The print was acquired by Rare Books and Special Collections in 2017. This exhibit was curated by Rachel Bohlmann, American History Librarian. The spotlight exhibit highlighted a manuscript archive for the pulquería El Tepozán, which includes real estate, licensing, and planning documents, and was recently acquired by Special Collections. On display was large-format plan depicting the proposed location and orientation of a Mexican tavern (pulquería). The plan is for one of four such establishments built by nobleman don Pedro Romero de Terreros, the Count of Regla, in Mexico City, beginning in the final years of the 1770s. This exhibit was curated by Erika Hosselkus, Curator, Latin American Collections. "Root for the underdog." "Champion the little guy." These thoughts often go hand-in-hand when it comes to David—armed with a mere sling and rock—taking on the mighty, armor-clad, javelin-wielding giant, Goliath. On display was an intriguing, action-filled depiction of this famous battle by Swiss artist, Tobias Stimmer (1539-1584). Stimmer's woodcut compresses different moments of the action into a single image. His woodcut accompanies the description of this event by the 1st-century Jewish historian Flavius Josephus in Conrad Lauterbach's 16th-century German translation of Josephus' collected works. 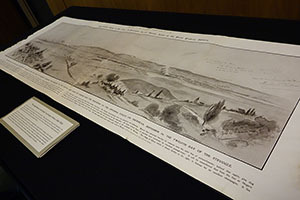 The Special Collections spotlight exhibit for October featured Stimmer's interpretation of this battle. For another take, the viewer was invited to take a walk to the Snite Museum where the Snite presents Rembrandt's David and Goliath (1655). Rembrandt's etching is on display through November 26, 2017 in the fall exhibition, Rembrandt's Religious Prints: the Feddersen Collection at the Snite Museum of Art. Philip Miller, one of 18th century England’s most celebrated horticulturalists, produced the acclaimed Gardeners Dictionary in eight editions. This display featured the illustrated volumes accompanying the 7th edition (1755-1760). These books are part of a collection bequeathed to Notre Dame by the prominent botanist Edward Lee Greene. Patriotism and militaristic pride abound in two colorful picture books from the World Wars, Hurra! Ein Kriegs-Bilderbuch by Herbert Rikli and Manövertag: Ein Soldatenbilderbuch by Erich Rohden and illustrated by Fritz Koch-Gotha. The books were used as propaganda to instill war-time values. Hurrah! tells the story of a boy who exhibits all of the qualities of a good German soldier, fighting valiantly to defeat Germany's enemies. Manövertag is a telling example of National Socialist propaganda promoting the duties of good German boys. This exhibit was curated by Sara Quashnie, who is a MLIS Candidate at the University of Illinois, Urbana-Champaign, with some help from Julie Tanaka. Sara was completing a practicum this summer at Hesburgh Library with Julie and Rachel Bohlmann in preparation for a career in academic libraries. June-October 2017: "Which in future time shall stir the waves of memory"
Among the characteristic manuscript forms of antebellum America are albums filled with poetry, prose, drawings, and other content created for the book's owner by family and acquaintances. Such friendship albums, as they are called, have a long history, but they were especially prevalent in the Romantic era, with its new ideology of sentimental friendship. In the United States friendship albums begin to appear in number in the 1820s, and while contributors were often male, the albums themselves were usually maintained by young women. The manuscripts on display in this spotlight exhibit were selected from Special Collections' manuscripts of North America holdings. On display was a map of North America by the important German cartographer J. P. Homann, emphasizing French claims in the Mississippi River Valley in the early eighteenth century. 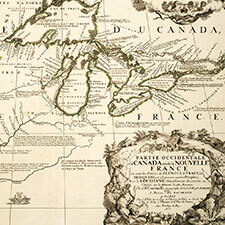 The map is one of several hundred items making up the Edward and Sheila Scanlan Collection of Maps of the Great Lakes Region, donated by the Scanlans to the Hesburgh Libraries in 2003-04. Saint Frances Xavier Cabrini, M.S.C. (1850-1917), also known as Mother Cabrini, was the founder the Missionary Sisters of the Sacred Heart, a congregation that established missions in the United States, Europe, South America, and eventually Africa, Australia, and China. Over 35 years, Cabrini founded 67 institutions dedicated to caring for the poor, the abandoned, the uneducated, and the sick. She was the first naturalized citizen of the United States to be canonized by the Roman Catholic Church, on July 7, 1946. 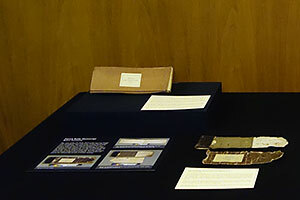 This exhibit—organized in conjunction with the conference "Too Small a World": Catholic Sisters as Global Missionaries, being hosted April 6-8, 2017, at Notre Dame—featured documents, canonization photos, biographies, and personal items that once belonged to Mother Cabrini, including a set of travel cutlery and a nightgown. 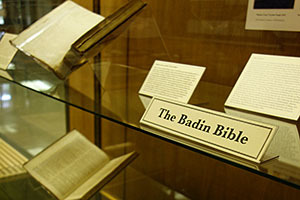 Rare Books and Special Collections thanks the Cabriniana Room, Holy Spirit Library, Cabrini University in Radnor, PA, for the loan of the artiacts on display. This exhibit featured the original working manuscript for a lecture on Abraham Lincoln, written by the Irish author Bram Stoker and delivered numerous times in Britain and America in the 1880s and 90s. The manuscript contains Stoker's text and many textual variations, with additions, deletions, and emendations in his hand throughout. This exhibit featured a leaf from a Bible formerly in the collection of Sir Alfred Chester Beatty (1875-1968), which belonged to his Western Collection (manuscript W.116). W.116 was sold intact on December 3, 1968 by Sotheby's (lot 14), where it was purchased by two biblioclasts who later cut it apart and sold the leaves individually. Notre Dame's leaf (Frag. I. 34) features a historiated initial by the so-called Dominican Painter (ca. 1250-1260). The exhibit was curated by David T. Gura, Curator, Special Collections. R. Branner, Manuscript Painting in Paris during the Reign of Saint Louis. 118-122. University of California Press, 1977. D.T. Gura, A Descriptive Catalogue of the Medieval and Renaissance Manuscripts of the University of Notre Dame and Saint Mary's College. 11-12, 449-450, 541-543. University of Notre Dame Press, 2016. Both scientists and the general public were captivated by birds during the eighteenth and nineteenth centuries. Seeking to enhance their study of such majestic creatures, naturalists sought birds out in their natural settings, describing them with precision and accuracy. Their work resulted in highly readable books filled with engaging descriptions of birds, but more significantly, they depicted what they saw in elaborate illustrations. Birds! Winged Wonders in Naturalists' Eyes offered a view of three remarkable and important texts. Featured were a full-color engraving of a white-bill woodpecker from Mark Catesby's Natural History, a steel engraving of a buzzard from the Comte de Buffon's Histoire naturelle des oiseaux, and the pioneering woodblock engraving of a sparrowhawk from Thomas Bewick's History of British Birds. The exhibit was curated by Julie Tanaka, Curator, Special Collections. The completion of a printed Bible in Irish has a long history, beginning in 1571 when Queen Elizabeth provided a printing press and Irish font for the purpose. An Irish translation of the New Testament was printed in 1602, and the Old Testament translation, known as Bedell's Bible, was printed in 1685. Published three hundred years after Bedel's Bible, Monsignor Pádraig Ó Fiannachta's An Bíobla Naofa is the first Catholic Bible in Irish. The earliest printed books in Irish were either Protestant publications, printed in Ireland and England, or Catholic works written by Irish priests and printed in Louvain and other centers of Cathloic learning. The Hesburgh Library holds a variety of Irish language printed books from the sixteenth and seventeenth centuries. The exhibit is curated by Aedín Clements, Irish Studies Librarian. This exhibit was dedicated to an important recent acquisition: a journal of sermon notes compiled by the Puritan minister Nathaniel Rogers (1598-1655), before and after his emigration from England to Massachusetts. Rogers graduated from Emmanuel College, Cambridge and served as rector at Assington, Suffolk before leaving for the Bay Colony in 1636. From 1637/8 until his death he was pastor at First Church in Ipswich, Massachusetts, serving as co-minister with the noted Puritan theologian John Norton. Rogers' biography appears in Cotton Mather’s providential history of 17th century New England. The 400-page journal contains roughly 135 discrete sections of notes in Rogers' hand, most of which reveal the structure and apparatus of the Puritan plain-style sermon. Nineteen of these sections bear attributions to other ministers, and were presumably sermons audited by Rogers. The remainder were written by him. Contents are broadly chronological, with entries extending from ca. 1634 to ca. 1645. The exhibit was curated by George Rugg. This small exhibit highlighted selections from the Hesburgh Libraries' collections of musical adaptations of Dante’s works. On view were historical examples of compositions relating to Dante's Divina Commedia and Vita Nuova. While Dante witnessed musical adaptations of his texts composed already in his own lifetime, they hit a high point in the mid-19th century when the author’s popularity surged in both Italian and translation readership. The exhibit was curated by Tracy Bergstrom, Curator of the Zahm Dante and Early Italian Imprints Collection. Elisabeth Markstein (1929-2013) was the daughter of a high-ranking communist official in Austria. Because of these communist connections and because her mother was Jewish, the family fled Vienna when Nazi Germany annexed the country in 1938. Eventually, the family found refuge in the Soviet Union, where Elisabeth spent her formative years from the late 1930s through the war years. After the war Markstein went on to earn a Ph.D. in Russian literature at the U. of Vienna and to study at the Translation Institute. In the 1950s she began a long career as a teacher, literary scholar, and award-winning translator. From her youth she maintained close ties with the international communist and workers’ movement; however, during the 1960s such events as the suppression of the “Prague Spring” contributed to changing her attitude toward the leadership in the Soviet Union. She became a staunch supporter of the dissident writers in Russia, and she will always be remembered for the key role she played in bringing the literary work of Aleksandr Solzhenitsyn to the West, acting as the author’s personal liaison and connecting him with the Swiss attorney Fritz Heeb. Solzhenitsyn won the Nobel Prize in 1970, and from the late 1960s through 1974 when he was exiled from the Soviet Union, Markstein was the linchpin of a network of émigré connections, translators, and contacts within the USSR. This archive consists of personal documents, correspondence (family, personal, and professional), papers dealing with Solzhenitsyn, scholarly research materials, photographs, and finally, audio and computer files. The exhibit was curated by Ken Kinslow, Manuscripts Processing Librarian. This volume is dedicated to Pope Clement XIII, an important patron of Piranesi's, and all three volumes focus on the environs of Castel Gandolfo, which is just outside of Rome, overlooking Lake Albano, and is the summer residence of the popes. On display was a print set within the ancient drainage tunnels at Lake Albano. The exhibit was curated by Marsha Stevenson, Visual Arts Librarian. The Catholic Pamphlets Collection in RBSC includes more than 5000 pamphlets, published from the 1840s to the present. This extensive collection includes pamphlets on saints and sacraments, daily Catholic life, moral issues, and Catholic social thought and action—as highlighted by the thirteen pamphlets featured in this exhibit. The exhibit was curated by Jean McManus, Catholic Studies Librarian. 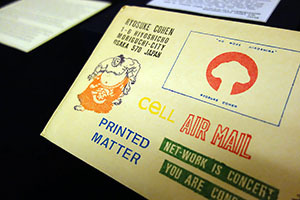 This spotlight exhibit showcased a piece of mail art sent by Ryosuke Cohen to the Soviet émigré artist and poet Vagrich Bakhchanyan (1938-2009). It is drawn from the substantial collection of mail art in the Vagrich and Irene Bakhchanyan Collections, acquired by the Hesburgh Libraries in 2013. The exhibit was curated by Chris Holdaway, Department of English graduate student. In 2001 Notre Dame's women's basketball team won the NCAA national championship. Exactly 100 years earlier an instructor at Smith College in Northampton, MA, Senda Berenson, created rules for women and girls for the new game of "basket ball." She published them in a series of guides by Spalding, the sporting goods manufacturer. By emphasizing teamwork over athleticism, and by minimizing running and physical contact, she addressed fears about the game's harmful effects on women and girls and defined the game for most of the twentieth century. 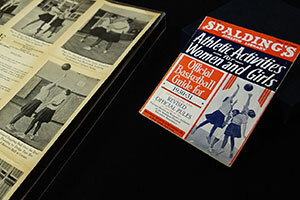 Spalding's Athletic Library series is an example of the significant sources held in the Joyce Sports Research Collection that document the history of women's sports in the twentieth-century United States. In addition to Berenson's rules and diagrams, Spalding published carefully staged photos of players and teams, along with advertisements for sporting goods. The exhibit was curated by Rachel Bohlmann, American History Librarian. "We are red men still, even though we have plucked the feathers from our war bonnets and are using them for pens. The battle scene has shifted and the contest becomes one of brain and wit." Native American writers such as Sherman Alexie (Spokane/Coeur d'Alene), Louise Erdrich (Turtle Mountain Chippewa), and Notre Dame alumna Kimberly Blaeser (Anishinaabe) are widely recognized as prominent authors and recipients of national book awards. Their work represents a small fraction of the published work—fiction, poetry, and nonfiction prose—which for two centuries has challenged stereotypes of Native people, corrected historical and anthropological narratives of cultural conflict and change, and perhaps most importantly, promoted specific identities, political sovereignties, and rights of self-determination. To honor this legacy, this exhibit presented a small sampling of the literature produced before 1924, when passage of the Indian Citizenship Act granted citizenship to all Native Americans. The exhibit was curated by Robert Walls, Teaching Professor of Native American Studies and Laura Dassow Walls, Professor, English Department. In 2003-04 the Libraries acquired an important collection of more than 200 historical maps of the Great Lakes region of North America, the gift of Edward and Sheila Scanlan of Neenah, Wisconsin. Ranging in date from the early 17th to the mid-19th century, the maps provide an historical overview of the area from its earliest development to the Civil War. This month's spotlight examined one of the Scanlan collection's most appealing items, Coronelli's Partie Occidentale du Canada ou de la Nouvelle France of 1688. The map treats what the French called the Upper Country, the vast interior of forest and lakes beyond the settlements of the St. Lawrence valley. It demonstrates the quite remarkable extent to which the fur trade had penetrated the waters of the interior by the end of the 17th century. The exhibit was curated by George Rugg, RBSC Curator. The posthumous First Folio printing of William Shakespeare's plays in 1623 represents a landmark development in the history of English drama, rescuing some of the bard's works that would have been lost forever. The earlier editions that do exist, however, differ markedly from the First Folio, and there is little evidence that Shakespeare oversaw their publication. What, then, is the "real" text? The Shakespeare we know emerges from hundreds of years of this debate. Current holdings and recent acquisitions in Rare Books and Special Collections shed light on the discussion as it developed into the nineteenth century. Selections from the Second and Third Folio accompanied printings by some of Shakespeare's earliest critical editors, including the famous poet Alexander Pope and the moral censor Thomas Bowdler. This month's spotlight exhibit was curated by Daniel Johnson, English Literature and Digital Humanities Librarian, and accompanied the special traveling exhibit "First Folio! The Book that Gave Us Shakespeare, on tour from the Folger Shakespeare Library." 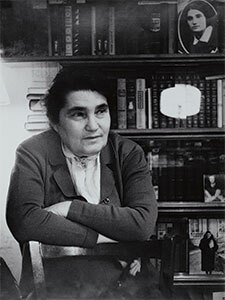 Evgeniia Solomonovna Ginzburg (1904–1977) was a journalist and teacher who wrote an acclaimed autobiographical account of her 18-year journey through the Stalin Gulag. Ginzburg's epic story, which has been translated into many languages, was published in English in two volumes: Journey into the Whirlwind (1967) and Within the Whirlwind (1981). To this day her work remains one of the most significant and widely-read women's memoirs about life and death in the Stalin camps. Born in the Kolyma camps, Antonina Axenova (1946-) was adopted by Ginzburg in 1949 when Antonina was 3 years old. Axenova later became a theater and movie actress. She has also worked tirelessly collecting materials to preserve the memory and legacy of her mother. Rare Books and Special Collections recently acquired this collection which consists of material related to Ginzburg's arrest and her life in the camps as well as material relating to Axenova's professional life. 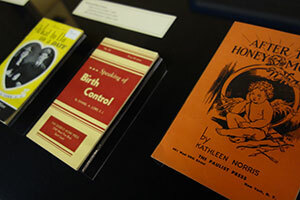 This spotlight exhibit was curated by Kenneth Kinslow, RBSC Assistant Librarian. W. B. Yeats (1865-1939) was a leading figure in the Irish Literary Revival. One of the greatest poets of his time, he was also a major force behind Ireland's national Theatre, the Abbey, and had a great and lasting impact on Irish culture and literature. Yeats was awarded the Nobel Prize for Literature in 1923. Visiting professor John Kelly alerted the Library to the availabilty of the Yeats collection of American scholar and bibliographer Milton McClintock Gatch. In all, 32 volumes from the Gatch Collection have been added to the Hesburgh Library. This acquisition adds significantly to the already rich Yeats Collection at the Hesburgh Library. Besides editions of books by W. B. Yeats, the Library holds a collection of Abbey Theatre Programmes, a Cuala Press collection (the printing press of the Yeats sisters), and a considerable collection of books illustrated by Jack B. Yeats. This spotlight exhibit was curated by Aedín Ní Bhróithe Clements, Irish Studies Librarian. 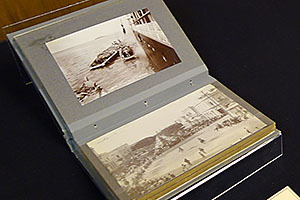 Rare Books and Special Collections recently acquired two photograph albums of Cuba: the Liebee Family Cuba Photo Album and the Gómez Souvenir Album (right). These two albums illustrate the manner in which late nineteenth-century travelers memorialized their journeys through photography. Advances in photographic technology made the medium more feasible and affordable for travelers of even modest means. These advances coincided with faster, more reliable, and more extensive transportation networks that enabled Americans to travel beyond their immediate region for both business and pleasure. The highly publicized military defeat of Cuba's colonial ruler (Spain) by the United States in 1898 stimulated a great deal of interest in the island and prompted the type of travel memorialized in the two albums on display this month. 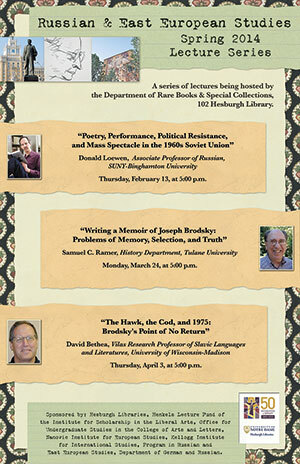 This spotlight exhibit was curated by David Dressing, Latin American, Latino, and Iberian Studies Librarian. Happy Birthday, Dante! In May of 1865, the city of Florence honored the 600th birthday of Dante Alighieri with a lavish three-day festival that included public celebrations of the author's works, concerts, and exhibitions. Our fall 2015 spotlight exhibit displayed some of the literary and commemorative publications released in conjunction with this important festival. The exhibit ran concurrently to the special lecture series "Dante's Other Works" 2015: A Celebration of the 750th Anniversary of Dante's Birth sponsored by the William & Katherine Devers Program in Dante Studies and Italian Studies at Notre Dame. The exhibit was curated by Tracy Bergstrom, Curator, Zahm Dante and Early Italian Imprints Collection. 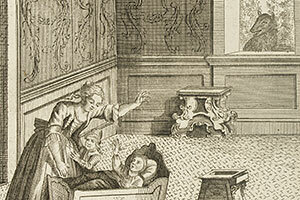 Giorgio Fossati (1705-1785) gathered 216 fables, from a variety of sources, into these two volumes. Each tale, given in parallel columns of Italian and French, is illustrated with a full-page engraving. Fossati has grouped the stories into six "books" of thirty-six, which are bound together in these two volumes. Each fable is accompanied by a full-page illustration intended, according to the author's introduction, to arouse the curiosity of the audience. Many of these compositions portray animals, with architectural settings frequently in evidence as well. This month's spotlight exhibit was curated by Marsha Stevenson, Visual Arts Librarian. Our May spotlight exhibit, curated by Liz Dube and Sue Donovan, showcased the treatment of two music manuscripts from the Captain Francis O'Neill collection. The manuscripts are the only two of their kind in the collection, and they were in poor condition after years of handling. Their treatment involved stabilizing the bindings and mending and resewing the text, which can be a time-consuming procedure, but which was rationalized by the items' importance in the collection and in RBSC. In the exhibit, the use of photographs together with the actual manuscripts allowed the observer to see the condition of the items before treatment contrasted with the condition after treatment. Have you ever wondered what goes on in the conservation lab, or what is Preservation? 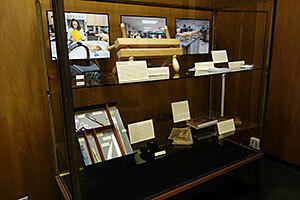 This exhibit sought to address the viewer's curiosity by displaying some of the main tools and materials used in the lab to repair both General and Special Collections—such as a finishing press and scuba diving weights. Also on display was a book in three different stages of treatment—before, during, and after. Questions about conservation are encouraged and can be directed to Notre Dame Preservation's Tumblr page. This spotlight exhibit focused on a collection of manuscript business records of the Birmingham, Alabama, Black Barons, an elite black professional baseball team during the pro game's long era of segregation. 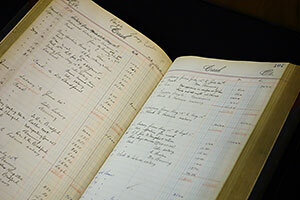 The most notable item was an account book recording the club's financial transactions with each of its players for the 1926, 1927, 1928, 1929, and 1930 seasons, including the legendary pitcher Leroy ("Satchel") Paige. The Libraries acquired the collection in 2005. The subject of this Spotlight Exhibit is a late medieval manuscript acquired in October 2015, Notre Dame Frag. I. 31. It is a set of five scholastic questions attributed to Giles of Rome (1243/7-1316), Master of Theology at Paris, Prior General of the Augustinian Hermits, and Bishop of Bourges. The manuscript is unique because it exists in the form in which it was circulated, two gatherings of seven folios total; it has never been bound with another collection of manuscripts. At least two of the questions do not appear in any modern edition. 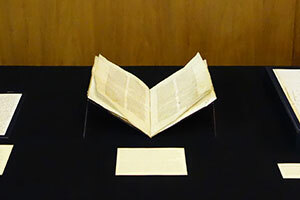 The manuscript is displayed open to fols. 4v-5r, including one of the unpublished questions on charity. Stephen Dumont, Professor of Philosophy, began studying the contents of this manuscript almost as soon as it arrived. His work will help ascertain the authorship and provide more secure dating of the text. This spotlight exhibit presented a satirical work titled Das Narrenschyff ad Narragoniam published by Sebastian Brant, a German jurist and humanist scholar, in Basel, Switzerland, in 1494. Lampooning and illustrating over 112 follies and vices of humankind, it became an international bestseller of the Renaissance as it was quickly translated into other languages. 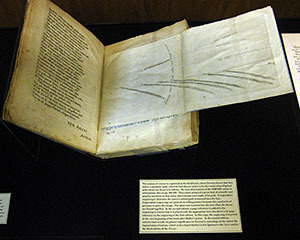 On display was Notre Dame's edition of the first Latin translation — done by Jacob Locher, a student and friend of Brant, with the collaboration of the author. This edition, which was printed by Iacobus Zachoni (Jacques Sacon) in Lyon in 1498, misspells the title as Salutifera Navis. 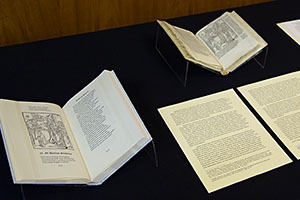 Also on display was a modern English translation by William Gillis (London: The Folio Society, 1971), as well as several illustrations reproduced from the Latin text. 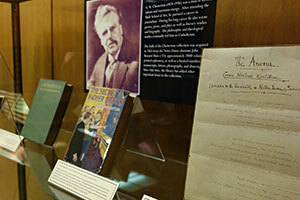 This exhibit provides a sampling of the G. K. Chesterton collection here at Notre Dame. The bulk of the collection consists of approximately 1500 books and serials. Among the books are some rare first editions. 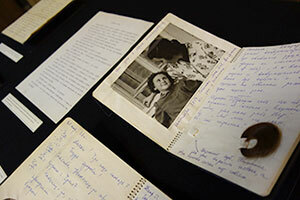 The collection also includes manuscripts, letters, drawings, and photographs. Much of the collection was acquired in 1965 from Notre Dame alumnus, John Bennett Shaw ('37). Over the years other items have been added to the original Shaw collection. This spotlight exhibit presented three Russian avant-garde books by and about Vladimir Mayakovsky (1893-1930), the great troubadour of the Bolshevik Revolution, as well as original documents pertaining to Mayakovsky and his circle. All are from the Herbert P. J. Marshall collection. Illustrated by such prominent early twentieth-century artists as El Lissitzky and Alexander Rodchenko, the books demonstrate new forms of design, typography, and language that emerged in Soviet Russia to inspire the revolutionary spirit. Herbert P. J. Marshall (1906-1991) was a British actor, scholar, and theater and film director; he was also one of the first English translators of Mayakovsky's poetry. In the early 1930s Marshall lived in Moscow, where he studied cinema at the State Institute of Cinematography under the tutelage of Sergei Eisenstein. The Hesburgh Libraries acquired the Marshall papers and his extensive personal library in 1993. 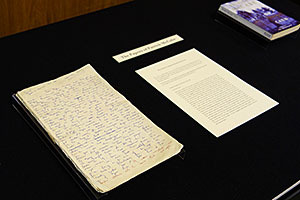 The Hesburgh Library recently acquired the papers of Irish writer Patrick McCabe. A leading Irish writer and former Distinguished Keough Visiting Professor at Notre Dame, McCabe was twice shortlisted for the Booker prize for his novels The Butcher Boy and Breakfast on Pluto. Born in Clones, County Monaghan in 1955, he is a writer of novels, short stories, plays and film scripts, and has been in the forefront of the Irish literary scene for the past thirty years at least. Featured was a pictorial news article by the prominent war correspondent, Frederic Villiers (1852-1922), about German entrenchments during the first Battle of Aisne. Villiers was among the early group of war correspondents—forerunners of today's journalists, such as Richard Engel, who report live from battle zones—who went to the front lines to obtain the most current news. These war correspondents were creating a new art form for news coverage that combined information, personal commentary, and images. Villiers' illustrated report was published in London as a special pullout section of the October 3, 1914 issue of the Illustrated London News, the first periodical dedicated to graphic news. This exhibit was one of numerous events across campus that commemorated the First World War centenary. Badin Bible Symposium: October 10, 2014, 4:00 - 5:30 p.m. Sponsored by the Cushwa Center for the Study of American Catholicism and hosted by Rare Books and Special Collection. 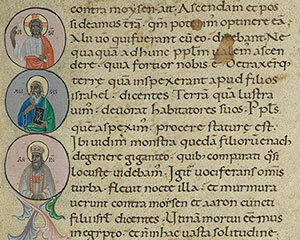 The Spotlight Exhibit of July features a leaf from a twelfth-century Italian Giant Bible. These large format Bibles were produced in Italy from the mid-eleventh through twelfth century. This particular page also contains a modern forgery painted in the left margin to drive up the price for an unsuspecting collector. For more information about similar holdings in RBSC, please see our Medieval Manuscripts page. 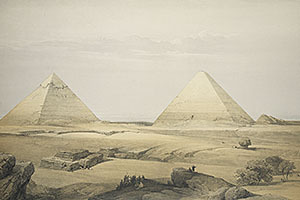 The Spotlight Exhibit for June features David Roberts' elephant folio-sized three-volume Egypt and the Holy Land of 1842-49. This collection of lithographs of the sites and monuments of Egypt and Palestine, done after drawings made on location by Roberts in 1838-39, is a key work in the evolving Western understanding of the cultures of the ancient Middle East in the 19th century. On display were a variety of items from the collection, which reflects the literary and intellectual atmosphere of Moscow in the second half of the 20th century. The collections consists of approximately 240 items, comprised primarily of manuscripts, letters, and photographs. For more information about these and other related materials in the Rare Books and Special Collections holdings, please see our Russian and East European Studies page or the finding aid for the Roskina Papers. In the Principia, Newton states his three laws of motion, which form the foundation of classical mechanics (the full title is Latin for "Mathematical Principles of Natural Philosophy"). On display was the Department's first edition, published in London in 1687, along with images from both the first and second editions of the text. On display was a lithograph, printed in Philadelphia, showing a family preparing to celebrate St. Patrick's Day, Ireland's national holiday, in their American home. The mother pins a shamrock on the boy's lapel, and he holds a drum, suggesting that he will join the parade. Meanwhile the girl waves a pennant from the window, where the parade is visible. Both Irish and American objects are visible in the room, along with furniture and a sewing machine that suggest a respectable, middle-class economic level. 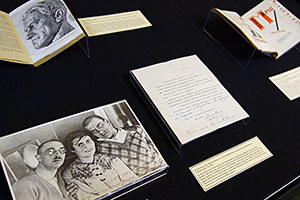 This introductory exhibit highlighted literary, artistic, and political samizdat works from the recently acquired Russian manuscript collections, including an original typescript of Varlam Shalamov's Kolyma Tale; Rimma Zanevskaia’s hand-made illustrated poetry collection; the 1979 Moscow Helsinki Watch Group Report on human rights abuses in the Soviet Union; as well as drawings, photographs, and correspondence of famous Soviet dissidents and samizdat publishers, among them Aleksandr Ginzburg and Vladimir Maramzin. For more information about related materials in the Rare Books and Special Collections holdings, please see our Russian and East European Studies page.